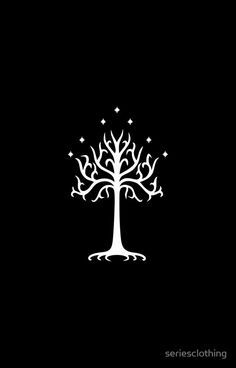 Symbol: A slender white tree with curved branches surmounted by seven shining stars, on a black background. Mogan's look is quite ordinary. He's one meter and seventy-eight centimeters tall, not too muscular, not too lean. Has brown, straight hair, some in a long braid that reaches his chest. his most apparent feature is the deep scar that runs along his face, from a bit above the right eyebrow to the left cheek, running across the bridge of the nose. Mogan has a number of similar scars, a couple on his left leg, one on the left shoulder right beside the neck, three parallel scars on his lower back (clearly the work of a beowulf), a scar left from a stab wound on the right leg (boarbatusk) and finally some scars on his right foot (due to surgery). All these scars caused by reckless uses of his semblance. Only when reading or watching his scroll or a screen, in order not to strain his eyesight, Mogan uses a pair of simple gray glasses that partially covers his eyes. Said eyes are a shade of reddish brown, surmounted by thick eyebrows the same color of his hair. A short unkept beard covers the lower half of his face. While awake, but only when it's not impolite to do so, Mogan keeps an unlit, short cigarette in his mouth. He doesn't smoke and the cigarette is, in fact, a reminder not fall prey to any kind of vice of that kind (all of his grandparents fell ill and died because of smoke and/or alcohol-related diseases). Mogan likes to wear simple and functional clothes, always dark and monochrome, usually a sleeveless turtleneck shirt (to make it easier to wear Give or Take) covered by a jacket and black jeans and shoes. (Made with "Mega Anime Avatar Creator": http://www.rinmarugames.com/playgame.php?game_link=mega-anime-avatar-creator) Many thanks to Zerko for the link. It can't be said in all honesty that Mogan didn't have a happy childhood. He was born in a wealthy family, the Treehouse, known for being a family which had produced over the generations many noticeable craftsmen, be it sculptors, painters, carpenters, blacksmiths and so on. The accumulated riches of so many successful artists meant for Mogan the possibility to grow in a large mansion in Vacuo, with loving parents and the commodities that money can grant. Both Mogan parents were artisans, his mother a glass blower and his father a weaponsmith for huntsmen and huntresses, and both were equally demanding when it came to their children. Mogan and his sister Willow were always expected to excel in school or in everything else but were not forced to study or practice to the point of exhaustion, it was more a kind of constant psychological pressure. Mogan, in particular, was considered since his early years as a kind of prodigy (while in reality he just was a smart kid, nothing extraordinary) and was always pushed to be the best. It was with this view that he was enrolled at Oasis Academy, so it wasn't exactly his choice to become a fighter, even if he acquired a taste for combat in time. If he had the chance to follow his aspirations at the time, he would have liked to become a musician, he didn't really have a choice in the matter and he liked to be an obedient child so he tried his best in combat school with praiseworthy success. His sister too was enrolled in the same school, a couple of years after him, but Willow always had a clear artistic flare that made clear to her parents that she would become a glass blower like her mother in time. Mogan, on the other hand, didn't seem to show passion for anything in particular, so he just followed the path that had been placed in front of him. His first years at Oasis Academy were not easy. Initially, he didn't have any friends because he appeared as an arrogant and often asocial person, but in reality, those were just a twisted kind of shield to conceal his own insecurities. Combine that to the fact that he almost always defeated the other students in combat class and you have the recipe for the most hated guy in class. After a couple of years, he eventually managed to make some few precious friends letting go of the mask he usually wore, and to that the last years of combat academy were the happiest of his life. He graduated from Oasis Academy with top grades, and the next obvious step would obviously have been Shade Academy. Mogan, however, wasn't sure he wanted to become a huntsman (especially after discovering his semblance in his last year at Oasis), but he felt he had no passion, no real drive for anything, so instead to be smart and brave by really thinking about his future and his aspirations, he decided it was safer to stick to what he knew he was already good at. Some of his friends choose different paths, but three of them went with him to Shade Academy and together they formed Team LMNS (team Lemons). Being the only male of his team, Mogan had promised himself that he would try to avoid developing romantic feelings for any of his teammates, in order to avoid conflict and confusion. That was easy for him, as he had known his teammates since Oasis Academy and he had never had any interest of that kind for them, nor they for him: they were friends, nothing more. In his second year at Shade all of that changed. One of his teammates, the one that gave the L to the team name, suddenly confessed to him. Having never had a proper girlfriend, but remembering his initial intention regarding his teammates, Mogan decided to play it slow. He wasn't absolutely against the idea, but he wasn't going to risk a fracture in the team either if things went poorly, so he agreed to go out with her to see if his feeling on the matter would change given the chance. He wasn't very optimistic but he was determined to try. Unfortunately, after just a couple of weeks, a mission came up that split the team in two. Mogan and his teammate Sylvan were sent on an easy search and destroy mission on a village, while Lavander and Nera stayed in Vacuo. The mission went smoothly, but due to adverse weather condition three weeks went by before Mogan and his partner could return. What he found was a team in shambles. Lavander had apparently cheated on him after just a couple of days, and that had lead to a break between her and Nera (that condemned Lavander's choice). Obviously, Mogan did not take the news with a smile, but for the sake of the team, he was ready to put it all behind and try to mend his and Nera's relationships with Lavander. What he didn't expect was what came next: Lavander requested to leave her original team. That only worsen the situation and, by the end of the year, Team LMNS was no more. At that point, Mogan felt he needed a fresh start, a new life, in a new place, with new people, and so he enrolled for his third year at Beacon Academy. What to say, what to say? Mogan really doesn't have the most complicated personality, at least he thinks so. His most recurring emotion, the one that is the reason behind many of his behaviors, is fear. The fear of being hurt, the fear of being judged, the fear of being rejected, the fear of not being good enough. As a result, he is an introvert that never really knows how to behave in most situations, due to his very low self-esteem. He's really slow when it comes to trust someone, and even then complete trust is something that could require years (as you can imagine that may cause some problems when you are put in a team). He often prefers a good book and some music to going out among other people, but that doesn't mean he can't interact with people. On the surface, he appears polite and quiet, well-read, serious, responsible and friendly, but that's because he is great at acting. Anyway, being really lazy, it's just too much work, so he just prefers to avoid social interaction (or at least that is what he tells himself). Yeah, Mogan is somewhat of a compulsive liar. He derives entertainment from telling harmless lies and always comes up with made up excuses to avoid commitments or activities. It's not unusual for him to just lie without a real reason, for example, if you ask him if he ever had a pet while growing up he might say he had three dogs, while in fact, he had a cat. Lie after lie the result is a massive house of cards made of lies to remember that can crumble at the simplest slip-up. But what if this facade is the person that other people learn to know, instead of the real him that's behind the surface? He has a sharp sense of humor (or so he likes to think), often misunderstood or kept to himself, but once he feels comfortable enough with someone he'll never hesitate in make fun said someone, which can make him really obnoxious sometimes. Mogan is a pessimist, and most often than not he'll deem some endeavors as hopeless before even trying. At this point, the obvious question is: should someone with a personality like this try to become a huntsman? The answer is no, right? I mean this negative attitude, this barely concealed sadness and loneliness are bound to attract all manners of grimm! And this is where the last major tract of his personality comes up: he just doesn't think about it. Mogan goes on with his lives day after day, without too much care, without giving himself the chance to dwell on bad thoughts, and whenever they come to the surface he retreats in some of his fantasies, or in a book or a song to just drive everything away. Alas, this unhealthy lifestyle can't be endured for long, and that's why Mogan decided to leave behind his old life and start anew in another continent, in another city, in another huntsman academy, in another team. Switching to more mundane topics, what does Mogan like or dislikes? What are his hobbies? Well besides books and music and games, he loves to cook, then eat what he cooks. He's a real glutton and if it wasn't for his training he would probably weight like an ursa by now. And what about Mogan's motivations? What drives him during a fight? With what spirit he goes into battle? What kind of fighter is he? Well basically Mogan fights because he has to, his primary objective is to preserve is own life and he tries to see a fight as nothing more than a part of his line of work. So you'll never see him sacrifice his own life to save someone else or even take a hit that could injure him and compromise his safety if he doesn't have a backup plan. On the other hand, he is quite competitive and it's not uncommon for Mogan to enjoy defeating his opponent or better yet slaughter grimm, in short, he likes the sense of satisfaction and superiority that you get from winning. These two aspects balance each other and the result is an analytical fighter that always tries to make an assessment of his chances of winning even before the battle starts. If he is not positive he can win he'll fight in defense and look for a way to escape or take his opponent by surprise, instead if he knows he will win he'll try to dominate his opponent and establish his superiority. It's petty, I know, and he knows too, but at least he apologizes after (usually). He becomes even more vicious if he has to fight an opponent who he feels is superior to him in some way (say someone with a powerful and cool semblance or an ancient grimm) and still manages to win. In this particular case, he will still try to end the fight as quickly and efficiently as possible, but he'll gloat for hours after (probably resulting obnoxious). Until now the only things I described are Mogan's faults, but he has his merits too! If Mogan had to describe his merits he would initially be unable to think of something, but those who know him and have been able to gain his friendship can testify that he can be a loyal and precious friend and be able to see the good in him when he doesn't see anything worth mentioning. First of all, he is a really good listener, attentive, not scared to tell the truth if he thinks it will do some good, and genuinely interested in others problems and eager to help and counsel if he can. He is extremely patient and always tries to give people the benefit of the doubt, and if someone mistreats him he will probably give that someone a second or even a third chance. Once he makes a friend, even if they have a serious quarrel and he thinks to be in the right, he will try to be the first to apologize and make up. He is discrete, helpful, generous. He's certainly not the most exciting person to be around, but he has his perks. Aura: Mogan's aura is dull gray, nothing flashy. He has an average aura pool but strives to increase it and to master the skill of using one own's aura to emit waves of force in order to compensate for semblance that can potentially be very hard and difficult to use. Mogan hates is semblance. Is as simple as that. Is a reflection of his personality that is unflattering, unforgiving, dangerous and most often than not just not usable. Is a stupidly complicated semblance with a lot of rules that, in the process of being discovered, earned Mogan his fair share of scars and miscellaneous injuries. It can be said that for Mogan using his semblance is equivalent to wagering. If he uses it from the beginning in a fight and he makes a mistake, then he'll pay by taking heavy damage that will take out a big chunk of his aura. But if he doesn't make a mistake, he can potentially get rid of his opponent in a handful of seconds and with just two or three well-placed hits. If he uses his semblance as a last resort, on the other end, when his aura reserves are already considerably reduced, just one mistake can result in serious injuries or directly spell his death. Using this semblance on a human opponent is even more risky, as said opponent could potentially understand the semblance's rules and exploit them to his advantage, thus having what is basically an extra semblance as long as he is fighting Mogan. Use the semblance from the beginning, without knowing what the enemy is capable of, and you run the serious risk of having said semblance turn on you by suffering too many hits and take too much damage (and/or reveal the rules of the semblance in the meantime). Activate it later, that is during combat, is risky because then Mogan must be able to not be hit by an opponent who has the advantage of having his own semblance and on top of that is already somewhat experienced in how to fight Mogan (it has to be said that his fighting style changes once the semblance is active, but you get what I'm trying to say). Now that your curiosity has been tickled, here the semblance and its rules summarized for your convenience. While his semblance is active, every hit suffered or inflicted by Mogan does not seem to have any immediate effect. All effects and consequences of the blow are delayed up to a maximum of ten seconds and then manifest suddenly, amplified directly in proportion to the time elapsed. The semblance works with any kind of non-prolonged impact. What really triggers it isn't the impact itself but the "will" of the person (or Grimm) behind it. Mogan himself is subject to his semblance, so his opponents can take advantage of the semblance in almost the same way he can (while fighting him), the only difference being that he knows how the semblance works. There are other details and rules, but these are the main ones, for more information look the complete version below. Now let’s explain in more detail how this semblance works, given that it has quite a number of annoying rules. 1) First of all it must be said that this semblance works with any kind of non-prolonged impact, such as punches, kicks, bullets, slashes, piercing attacks, explosion, shockwaves and so on. Things like holds or bites, on the other hand, might trigger the semblance at first, but it will soon stop if the pressure continues to be exercised. In this last case it will be as if the semblance had never been triggered and except for the very short delay, there will be no increase in the consequences of the bite. 2) While the semblance is active what really triggers it isn’t the impact itself, but the “will” behind it. Let’s say that someone is holding a gun and pulls the trigger with the intent to kill, wound, damage or incapacitate (or, more generically, by someone with violent intention), then the bullet fired from that gun will trigger the semblance even if it hits Mogan by mistake while it was aimed at someone else. But if the trigger was pulled by mistake or, for example, by someone who just wanted to scare by shooting upwards, in this case even if the bullet hits Mogan it will not trigger the semblance. The same applies if there is an earthquake and a piece of ceiling falls on Mogan's head: the semblance will not be triggered. On the contrary, if someone is responsible for an explosion that causes the ceiling to crumble, in that case, the semblance will trigger if the one causing the explosion knows it will possibly hurt someone. So it doesn’t really matter what hits Mogan or how, as much as why he was hit in the first place. 3) The most annoying and dangerous aspect of this semblance is that the user is subject to it too so that its effects are exploitable even by his opponent. The only advantage Mogan has is to know the rules of the semblance and be accustomed to the precise timing it takes to use it effectively. That’s why is important, when battling a human opponent, to either end the fight as quickly as possible, to use the semblance as a last resort, or even to deceive the opponent to prevent it from discovering how the semblance works. 4) What exactly does “Increase the consequences” means? For every second that passes after the semblance has been triggered, the consequences of the hit (given or suffered) increase progressively, and after ten seconds (if the semblance gets fully charged) consequences three times the originals will crash on the target. Let’s say Mogan punches a Beowulf in the face it but lets the semblance work its magic: after 10 seconds the Beowulf will finally receive the effects of the punch as if it were three times stronger, faster and bigger then it originally was. That will most probably cave in the Beowulf's face, or break the Beowulf's neck, or tore his head from his shoulders, or explode the Beowulf's head, depending on the power of the original punch. For a hit by a blade, the cut that the attack would normally cause will be three times deeper, wider and longer. Against an opponent whose aura is unlocked, the aura will have to be factored in calculating the damage. -A) Hit the same target again before the previous strike has ended up charging. This will cause the first strike to immediately stop its count and be delivered early (appropriately amplified), while the second strike starts its countdown. -B) Hitting who hit you first will have the same effect as the first method. -C) Remove the “will” of the person or Grimm, that is responsible for triggering the semblance in the first place. This means either to kill the target or make him lose consciousness. If this condition is fulfilled, the consequences of the strike suffered by Mogan will simply not appear and it will be as if he was never hit in the first place. Thanks to this rule this semblance (even if the risks remain the same and increase exponentially with the numbers of enemies) can even be used to fight multiple opponents if Mogan has an adequate backup or is able to not be hit in rapid succession. Let’s use as an example a horde of ursai: Mogan hits one ursa in the head or in the chest before it hits him, then moves to the next, and the next, repeating the same operation without being hit by the same Grimm more than once in rapid succession of before being able to hit the ursa first. In this scenario, after ten seconds, the ursai previously stricken will most likely instantly die if the hit was well placed, while the ones that actually managed to score a hit before Mogan could strike at them can be eliminated by eventual allies. If said allies manage to kill the Grimms that triggered the semblance before the ten seconds have passed, then it will not matter how hard he was hit by any singular ursa or by how many, for Mogan will not suffer any kind of consequence. This pretty much means that with the right backup Mogan can become an almost invincible entity on the battlefield. One mistake though, a single slip, will be fatal (because even if only one strike succeeds in charging to the limit, it will almost certainly erase a big part of Mogan’s remaining aura in one go or badly injure him, leaving him helpless and surrounded by creatures of Grimm). -D) Take a hit from the same target that triggered the semblance on you before on purpose, while “wanting” for said hit do harm you. This will not only stop the count of the first hit but will not trigger the semblance on the second one and will reset the countdown to zero for the first hit. This way both hits won’t have any additional effect (the first hit’s normal consequences will appear at the precise moment the second hit connects). Unfortunately, this trick only works if you already are under the effect of the semblance, so it cannot be used on the first hit even if you are willing to take it and be harmed by it. -E) Mogan has to hit himself with the intention of doing at least half as much damage to himself as he would have normally received by the first hit he tanked. This effectively increases the initial damage by 50% but is always better than letting that damage become three times the original. This last rule is the only one that applies only to Mogan and not to his opponent because for all intent and purposes he is using his own semblance on himself to override the "will" behind his opponent's hit. This second blow also follows the previous rule and it won't have any additional effect. 6) At this point is quite clear that this semblance is very powerful, and it would definitely be overpowered if it could be activated and deactivated instantly, but that is unfortunately not the case. Before the semblance actually turns on, ten seconds have to elapse from the moment Mogan wishes to activate it. Once the semblance is active, it cannot be deactivated until at least 100 seconds have elapsed since the semblance was activated. After 100 seconds have passed Mogan can choose to keep the semblance active for another 100 seconds or turn it off. Mogan can keep his semblance active for a maximum of 300 seconds (five minutes) during the course of a day (that means that he can activate it up to three times for 100 seconds each, just one time for 300 seconds or two times dividing the duration). All the effects of the semblance have to be resolved, so if a hit is still charging when the countdown ends, then it will be immediately delivered with the appropriate increase. Once the five minutes end, before Mogan is able to activate the semblance again at least 12 hours have to pass and during those 12 hours, he must sleep for at least 3. 7) There are a couple of important clarifications to make about what can actually be affected by this semblance. Inanimate objects can be affected by the semblance if the user wants to destroy or damage the object, but only in these two instances. But what happens when it comes to weapons in a person’s hand? Are the weapon and the person considered as a single entity by the semblance? In this case, it becomes a matter of perspective. If the goal is to damage the opponent and not the weapon, then striking the weapon will not trigger the semblance because technically there is no ill intent towards the weapon. This means that it is theoretically possible to apply a charging hit to the opponent’s weapon and another charging hit targeting the opponent’s body without the two interfering with each other. But this applies only to weapons that objectively can be considered as “separable” from the opponents such as swords, hammers, staffs, while gloves or boots used as weapons are not objectively separable since any blow they receive will necessarily affect the user. But here is the catch: only Mogan knows of this rule. So if an opponent wants to punch him in the face, but Mogan deflects or blocks the punch with his armored hand, chances are that his opponent will not have the same ill intention towards what he most likely considers as a part of his target that's not worth trying to damage, so in the mind of Mogan's opponent it would be like striking something other the Mogan, and in so doing eluding the semblance. Figuring out how this rule works is the first and most important step to understand the semblance in its entirety and consciously turning it against Mogan. So he goes to great length to prevent this from happening, often bluffing, acting and lying to confuse and deceive his opponent. As final notes, let’s reveal two good points of this semblance: the first one is that there are no clues that indicate if the semblance is active or has been triggered (no visible aura, no flames, no sound, etc); the second one is that the semblance does not rely on the aura reserves of the user to work. This second note means that a hit charged by the semblance does not require aura to charge and that the semblance can be used even if the aura reserves of the users are almost empty. Combat Behavior: Having such a problematic semblance, Mogan has had to develop a fighting style that does not rely on it and that aims to have an extremely solid defence, which is based on dodging and deflecting incoming hits rather than blocking them (so as not to risk triggering his own semblance, if it is active), and waiting for the right time to counterattack. His high efficiency in hand to hand combat gives him an edge if he can get close to his opponent, and even against weapons like swords and the like he is still advantaged by the possibility of disarming his opponent. He is a very agile and quick fighter that jumps, dashes and dances, around the opponent if necessary, but that prefers to minimise his own movements in order to conserve stamina and whose strikes are very fast and accurate, aimed either at disrupting the enemy's pace in order to create openings (if the adversary in question his equally or more skilled) or at specific vital point (if an opening presents itself) in order to end the fight as quickly and efficiently as possible. In short Mogan's fighting style is designed to keep him in fighting shape and, most importantly, alive for as long as possible. In order to complement his style, Mogan makes ample use of feints and tricks during combat, and always tries to understand how his opponent fights and thinks to obtain any kind of advantage and to be able to decide if he can afford the risk of activating his semblance or not (he always tries not to, in any case). Even with these adjustments, Mogan remains a heavily unbalanced fighter. For example, in a team, his sudden and unexpected defeat could lead to the collapse of the whole group. In a sense, this semblance is the result of Mogan's insecurities and fears. It's almost as if his semblance is challenging him, forcing him to believe in himself, to shoulder responsibilities and take risks when using it, or to always give his best in order to compensate for not using it. It forces him to think well before he acts, to plan ahead, evaluate and study his opponent or the situation. In short, his semblance forces him to improve, while he is on the contrary often convinced to not be good, strong or smart enough to achieve his goals. On the bright side, as long as he doesn't need to activate his semblance, Mogan can serve as a tank or as bait against a fair number of enemies, but only if he is able to dodge or maneuver around them. Truth be told his worst matchups are things that most hunters would consider as minor threats: a flock of little nevermores is easily Mogan's worst nightmare. He lacks the means to dispatch them quickly and in great numbers, and even swinging around the whip on one of his arms can't compensate. If ever such a group of Grimms should attack him while his semblance is active, Mogan would die, is as simple as that. That's because every single scratch from every single nevermore would count up to three times its original damage, his aura would be completely drained in 30 seconds tops and in even less time he would probably bleed to death. Not the most enjoyable way to die. Following this trend, it's easy to imagine that against Mogan the bigger the enemy is, the better. Against a big target is easy to make each cannon shot count, and such enemies are usually slow, which is ideal if Mogan decides to use his semblance. He could kill a goliath alone without too much effort, probably even an entire group, but put him against a group of small nevermores, creeps or lancers and chances are he'll try to run away. As far as human (or faunus, I don't discriminate) opponents are concerned, anyone who can attack from long-mid range and is able to keep his distance can easily defeat Mogan without too much effort (the only things to watch out for are the cannon and the grappling hook, but any huntsman or huntress, should be able to dodge those no problem). Of course, Mogan is aware of his weaknesses and always tries to engage in close quarters, where he has a substantial advantage. First of all his armored arms grant him a naturally strong defense, thus allowing for a more offensive approach against opponents who lack the ability to deliver strong blows. Slow and strong opponents are even easier because they probably won't be able to land a hit. Mogan's style and weapons, however, give their best against those that rely on their weapons and can be disarmed. Whether it be swords, hammers, daggers, scythes and so on, it's easy to catch, push, pull or strike aside them in a way that forces the user to either lose the weapon or suffer some blows to keep it. All of Give and Take functions are pretty easy to understand: you have armor, a cannon, a blade, but the whip seems a bit out of place, right? First of all, when he designed his weapons, Mogan felt he needed some form of tool to reposition himself during a fight, so he thought of the grappling hook, but it seemed a bit of a waste to not add anything to that, so it became also a whip. Then again a whip was pretty much useless for the kind of defensive style he wanted, and would not even be a good offensive tool, so he added the lightning dust. Basically the whip is just a distraction, something to use in order to stun for a moment an opponent Mogan can't reach with fists and close the distance, or just wrapping the whip around the enemy's weapon can impair it's movements (giving him the chance to land a hit) and there is a chance to electrocute him through it (giving him the chance to disarm the target, probably using the other hand). In short, it should serve as a versatile mid-range option and not at all as a defensive tool (well maybe he could think of a couple of ways to use it to stop bullets, but it seems a bit far-fetched). Most of the time the whip will just be coiled around the wrist and Mogan will use the hidden blade on the same arm. Give or Take are basically two pieces of heavy armor that cover up to Mogan's shoulders and are usually carried around in a black business suitcase equipped with two very useful concealed openings on each side that allow for quick and easy withdraw of the weapons inside. Mogan inserts an arm in each opening, and the suitcase rearranges itself to cover both arms with the respective weapon/armor. The two pieces are quite different from each other but are not fixed to a specified arm and Mogan can decide (based on the side of the suitcase when he inserts his arms) on which arm put Give or Take. What remains of the suitcase after Give and Take have been put on rearranges itself if the form of a utility belt that Mogan uses to store snacks, ammunition, snacks, dust, snacks, a flask of water, snacks, his scroll, snacks... I'm kidding, there are just one or two snacks... Really! Don't ask for them, he won't give them away, so you may just as well forget about their existence. To put these three pieces together Mogan presses the palms of his hands together while keeping them parallel to the ground, and the armor on his arms collapses on itself to reform the suitcase, of which the utility belt will then rebuild the top and the handle. There isn't much to say about Take that isn't clear to see, really. It's a heavy piece of armor that provides an excellent defense, the forearm and the arm up to the shoulder are covered by overlapping plaques, curved and smoothed to facilitate the deflecting of hits. On the juncture with the wrist is what appears as a circular gemstone, but really is just a rechargeable container (made of an even more durable material) of powder dust. This ammunition get's used up all at once every time Mogan uses the cannon that this weapon becomes (more details under "Dust functions"). When in "cannon" mode the armor on the arm and forearm collapses in a cannon with two muzzles, one just above the wrist and the other at the elbow, while the hand remains unchanged. The hand is, once again, very well armored and equipped with claw-like fingertips and spikes at the end of the first phalanx of each finger, and is used to tear, cut, punch or grip the opponent or his weapons. The grip, in particular, is considerably increased by a mechanical feature of the hand, making it quite hard to get free once it grips something. Give is a quite different from Take in terms of design, is leaner and clearly doesn't hide a cannon. It does, however, hide a blade that can come out from the forearm towards the wrist or towards the elbow (it's not long enough to come out from both extremities at once). 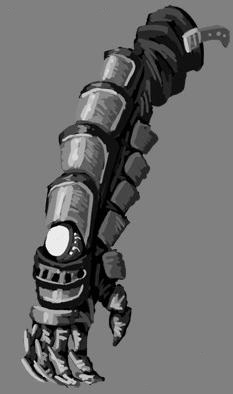 The hand is equipped with the same grip augmentation device Take has, but it doesn't have any claws. What it does have is a whip with numerous spikes coming out of it. When coiled around the wrist the whip has four of its spikes in correspondence of the knuckles (just to give punches some extra punch, if it makes sense). As every good mechanized weapon in Remnant, Give is also a gun! Well... more like a grappling hook, but it still counts! The whip wrapped around the wrist can be uncoiled and be used as a whip, of course, but can also be shoot out at high speed and anchor itself to the first surface it touches (if the tip of the whip, which is a spike of solid metal, can pierce it, it will then spread open). Give has, of course, the right gear to automatically wind back the whip/grappling hook, and is able to lift the weight of one more person besides Mogan's (any more than that and the mechanism will simply fail and probably break under the stress). Is really hard to cut or damage this whip even when is under tension, but a scissor-like weapon with a strong user could still cut it. When it comes to Dust, Give has a hollow tube running along the length of the whip. Said hollow tube can be filled with dust powder that manifests itself through the spikes (more details under "Dust Functions). The actual whip is three and a half meters long, while the grappling hook can reach up to 10 meters (only the part used as a whip is equipped with spikes and dust). Let's start by talking about the dust functions of Take (the one with the cannon), which really boil down to what kind of dust and ammunition it uses. The answer is simple: propulsion dust used to fire big explosive bullets. The result is a highly destructive impact that, if able to pierce the target, will detonate inside it causing serious damage to almost every kind of grimm. The downside of having such powerful ammunition is that every third shot the cannon must be recharged. Give is potentially more versatile, given that its whip could be charged with any kind of dust, but there really isn't any advantage in having a flaming whip or one that freezes on contact. Charge it with lightning dust however and once you try it you'll never want to change dust type again. The only thing lightning dust can do is electrocute the target, likely stunning them for a short while without doing any meaningful damage, but it's more than enough to gain the advantage and land a hit or two, or better yet a point-blank cannon shot. Grimm are quite easy to hit with the whip but most human opponents will either dodge it or block it with some kind of weapon, however, most weapons are made of metal and can potentially conduct electricity straight to the wielder. Even when the whip is coiled around the wrist of Give, it can be used to shock the enemy with each punch. Obviously, both Give and Take are made with non-conducting materials (at least externally), but if Mogan hits himself somewhere else by mistake with his whip he will be electrocuted like any other living being. There really isn't much of a story behind Give or Take: they were made for Mogan by his father when he enrolled at Oasis Academy. The only noticeable feature is that they were remade several times over the years to add new features or tweak some aspects. Their first iteration was just simple armor with claws, the second one added the blade and the cannon, the third added the whip and the grappling hook, and the fourth and final one (once Mogan discovered his semblance) reinforced the armor and the defense it could provide and added the grip augmentation to the hands. OK there are a few odd word choices but that's nothing too big. The two things I'd like changed are you to space out the paragraphs a bit more to make it easier to read and add a TL;DR for the semblance. This stands for Too Long; Didn't Read and could be helpful giving someone a brief synopsis of the semblance itself again to help with reader comprehension. You kinda have something like this already but really try to get across the core idea in as few words as possible. You can put the TL;DR in a spoiler or everything else in a spoiler it's up to you. Sorry for the odd words, but sometimes my vocabulary lacks the right terms I'm looking for so i have to use something like google translate and hope that it doesn't make me use the wrong word. I added more pieces of information in the summary and spaced paragraphs. Is it enough or should I summarize a bit more of the semblance rules? Also, I have to ask, but is the semblance really ok? I mean I think it has clear weaknesses, limits and is overall pretty well balanced with this high risk-high reward style, but it also has the potential to be quite devastating and possibly unstoppable in the right circumstances. I built the character around it and it would be a shame to have to rewrite it in something different or unsatisfactory down the line if after a fight or two it turns out to be overpowered for the standards of the game (granted I don't plan to use it often, but I'd like to be sure). If it helps I can give you some examples of things my character could do with this semblance that could potentially be seen as overpowered. Yes the semblance is a bit odd, I'll be watching how you use it and of course you will need another mods approval as well, but I think it's interesting and am willing to give it a chance. The weaknesses are pretty obvious, third years have a bit more leniency than first years and being at Beacon for three years means that most aware students probably have a rudimentary idea of how it works. I would recommend putting the TL;DR at the top of the semblance section. So there is the possibility of having to rewrite it. I guess it can't be helped then. Another thing: what do you mean by "most aware students probably have a rudimentary idea of how it works"? The entire point of being a transfer student and someone who tries not to use his semblance was precisely to keep it a secret for as long as possible to as many people as possible. After all, it is the greatest advantage but also the greatest weakness of my character, so it would be far less effective if someone already knows of it. Plus is certainly not a semblance suited to be used during training or spars, so basically, no one except should already know how the semblance works, yet. Well he would have likely competed in the Vital festival and there would be combat classes which he has to show at least some degree of it. You could also talk to former school mates to get info on an opponent. I'm not saying it will happen every fight it's just another think you might have to worry about. Sure he probably competed in the Vital festival, but both there and in combat classes, you are not required to use your semblance if you don't want to. Take Ren or Jaune for example, one has a semblance that's not useful in combat and the other still hasn't discovered it yet. On asking the former teammates, you are right: that's probably the only way to get some info on the semblance at the moment. No doubt if my character ends up in a team, sooner or later he will have to reveal his semblance, (if only to not get killed by accident if his teammates don't know how it works). Anyway while I wait to be accepted in a team (after the character has been approved), is there something else I can do? Some solo mission, maybe some other role in Vale with others? Do I have to ask on Discord or is there some thread I can look at? As soon as they are approved you can start using them in threads. There isnt a permission thing or anything but we would strongly prefer it to not have significant knock on affects to everyone else, those in the thread can be affected but not much for outsiders. You could start an open or semi-open (limiting number of people, 4-5 is a good number) thread yourself the moment morgan is approved. Or you can ask people if they have threads for a third year, I think Aros had one but might be full but still ask around. There are also already going open threads you could join like the holiday formal too get your feet wet as quickly as possible. 1. Mogan is able to cause up to 10x his damage output depending how long he waits? 2. The damage Mogan receives while his semblance is activated will also increase the longer he waits? I just want to make sure I'm reading this correctly as, if that is the case, then this semblance is definitely too OP despite how big of the weakness it has. To deal 10x the damage with his cannon form would basically be giving him the capability to cause damage close to that of a small nuclear bomb, which would definitely be unacceptable. Now, I do love the idea of the semblance. However, I would strongly advise that you tone the damage down from 10x the amount to about 5x. Remember, though he is a third year student, he is still a student and is still able to grow in his semblance abilities. Again I strongly advise that you lower the damage so that it gives him room for growth. Aside from the semblance, everything else seems fine. I won't be too nit-picky about your character since this is your first one, but the semblance definitely needs to be addressed. Feel free to PM me here or on Discord and I'd be happy to discuss this with you. I made all the changes and adjustments we discussed, so the semblance should be ok now. Thanks for the review and the patience! I made a little change to the sixth rule of the semblance, specifying that the max duration of 300 seconds can be divided into chunks of 100 seconds each. We didn't discuss this possibility, but I trust it won't be a problem since it doesn't change the terms we concorded. It just seemed a bit of a waste to be forced to use all 300 seconds in one go. Also, since it's apparently hard to find a third-year team, I wondered if there was still the chance to leave the age and school year of my character unclear to increase the chances of finding a team. No first or second year, but I'm fine with fourth or even fifth year. Anyway even being a lone transfer student is ok, so once the character is approved I think I'll try to join some roles on my own while I wait for a team. So after everything we've discussed and looking it over again, everything seems fine for me. As for the whole 3rd year team portion, there are a few third year students out there so I would recommend you keep him as a third year. I can tell you now that I currently have a third year who was on a team, but that team fell through so she's more or less teamless now. Just post that you're looking for a third year team and I'm sure some people will crop up. All that said, Approved 2 of 2.